That’s the main problem with local blogging and local content. It’s often easy to get local traffic to your website or blog, but in a lot of cases, you’re going to have trouble converting that traffic into customers. as traditional media declines, that’s less online coverage of local events, businesses, etc. So driving traffic can sometimes be pretty easy. The problem — the “con” — is converting that traffic. Several years ago, my wife and I launched four local blogs — one for each of the main towns in our region. My wife is a real estate agent, so being an expert on the local area is a big selling point to buyers and sellers. CREHST is a well-known museum in our area and they regularly put on events like this. Their website wasn’t updated very often, so our blog posts often collected all the search traffic for people wanting information about events. 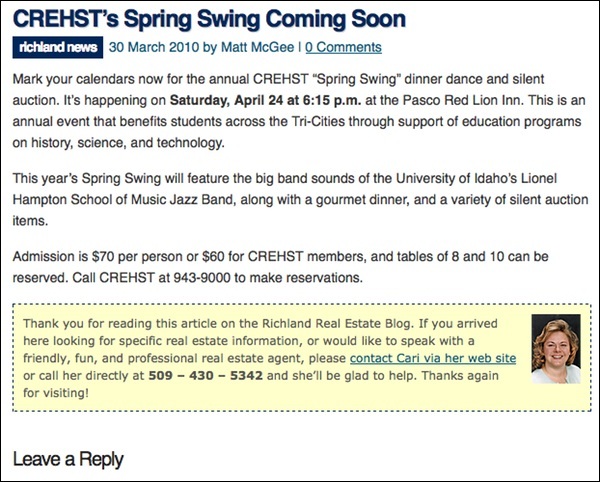 As you can see, the posts ends with the museum’s phone number … but it also has that yellow content box, which was a piece of default content that appeared on every blog post to encourage people to contact Cari for real estate help. We put that on each post because, well, what’s the point of local blogging if you’re not trying to earn new business, right? The problem is obvious, isn’t it? People looking for museum event information aren’t looking to buy or sell a house. So we had no trouble getting traffic to the blogs, but it was unqualified traffic. And making matters worse, the more content we posted, the more phone calls Cari got for everything except real estate. Even though we always put links and phone numbers on these blog posts, she got calls every week from people wanting directions to the museum, opening/closing hours, admission costs and you name it. No matter type of content we posted, she consistently got off-topic phone calls that kept her from doing her regular real estate work. In retrospect, some of the posts we wrote were actually detrimental to her business. Dr. Michael Dorausch is a chiropractor in Los Angeles and a really smart guy in the area of local search and local content. I had him speak on my local panel at SMX Advanced last year and he talked about creating local content to drive traffic and conversions. At SMX, Dr. Mike explained that content like this helped bring runners into his practice because they needed his services before/after the race. So it was good, at least to some degree, for conversion. And did you notice? No phone number in his post. I emailed Dr. Mike and mentioned the off-topic phone call issue that my wife had to deal with and he said, yep, same thing happened with his content at first, so he decided to stop putting phone numbers on his local content posts. I’m focusing on the inclusion of phone numbers above, but this is about more than that — it’s about making sure that you create local blog content that not only attracts visitors, but does it in a way that the traffic has a chance to convert into customers. That’s the main problem you have to be aware of when creating local content: You may struggle converting traffic into customers. And don’t make the same mistake that we did when we made it easy for that non-converting traffic to distract us with phone calls and emails that weren’t business related. So, your To-Do item is this: As you create local blog posts and content, think about what type of visitor each piece of content is going to attract. If it’s a visitor that can be converted, try to convert them. If it’s not, either don’t create the content at all, or make sure those won’t-ever-convert visitors don’t get in the way of running your business. Your turn: Have you had similar struggles in converting some of your local traffic? Let us what your experiences have been — good or bad. Comments are open. What a great use of a blog in Dr. Mike’s case, really generates some ideas. Thanks for putting this together, Matt. I have been using a blog for a client of mine for about 3 years now. In the past year I shifted the focus to try to capture local business from it vs. just trying to gain traffic. The payoff has been wonderful. We setup a post when they have a special event going on and incorporate Eventbrite. It’s great because we can track all the leads that come in and keep a tight reign on the marketing budget through AdWords. The client really likes this because he can see a direct/clear ROI through ticket sales online. Excellent thoughts. Thanks Matt! This really puts a damper on a strategy I’ve been brainstorming for my own business, but it’s great to know up front. I’ve considered the conversion factor from a “subtle exposure” point of view and perhaps building an email list, but I still need to consider the probability of the non-targeted traffic actually converting. It reminds me of random marketing acts like leaving a business card at a gas station pump in hopes of a customer match (who would take action) being next in line. I clearly wouldn’t pursue the latter, but I wonder just how similar the two scenarios are- just with different mediums. I’ve also considered writing to produce long-tail keyword traffic as a brand and “tribe” building strategy – writing about things I enjoy like supporting local business, riding bikes or trail running- building the brand, then associating the brand with what I do (also real estate) through my web site. However, it seems that this too would be a stretch to convert, especially over the shorty term. As you note, it may be possible, but with some additional effort beyond simply drawing traffic. We’ve found that blogging about local aspects of things that relate to our businesses really helps increase conversion versus purely local content. For example, a plumber is going to face different challenges in a place like Texas with clay soil that causes lots of foundation issues, compared to one in New England that deals with basements and freezing weather conditions. Use this method allows blog content to be both local and on-topic which we’ve found is effective for conversion. We have not tried any super-local blogging like the events that you’ve mentioned. Sounds like an effective way of adding some additional local context to the website. These both look like off-site blogs. Is that how you are recommending the blogs be set up? Hi Susan – they are both off-site, but no, that’s not what I generally recommend. I know I’ve written about why this wasn’t the best set-up before, but just spent 15 minutes looking for the article and came up empty. In our case, my wife and I set up four blogs as an experiment — one for each main town her real estate business covers. She also had a blog on her main site. The four city blogs were setup to give us more of a general local content platform, while her own blog would focus on real estate. These blogs were also setup at a time when exact-match domains had a stronger SEO impact, and they got a lot of search visibility because of that. As I say above, we succeeded in getting a lot of visitors to the separate blogs, but they were untargeted visitors who didn’t care about real estate. That, plus the hassle of running so many blogs at once, convinced us to shut them down a couple years ago. Getting the local traffic can be done with the blog or content but having designated pages for each area you want to cover combined with each service you offer will expand your site and bulk up your content. You will gain coverage for your services and the locations you service. It’s an easy formula really… 1 page = 1 service + 1 location (usually a city). Repeat for every service you offer multiplied by the number of cities you service. Such a great topic to cover! Generating traffic isn’t always in the best interest of your website. Qualified traffic is key. If you’re looking for conversions for your business, it’s best to really research some topic ideas. Would a potential customer find this helpful? Is this what my target market wants to know? 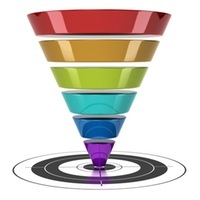 Developing targeted, local blog posts is definitely the way to go. This an interesting topic. I have tried some blogging on off-topic subjects in different cities in local service area for clients and have some success, I think. It is hard to tell with so many things in the mix. Essentially, I have taken a city and written about some of the main attractions and events. Then I have linked them together with see our other posts on city X and link to a landing page for service + place in order to create a ‘cluster’ of posts about a place. So, branding and internal link building were the main reasons for the posts. So if qualified leads come through the landing pages, these off-topic posts may be able to lift up the landing pages, in other words, increase your ‘relevance’ in a particular city. It’s cool you guys tried that. Nice idea to get a lot of very local traffic. My local clients would kill me if I made them blog and it didn’t convert 😉 most of them just don’t have the inclination or time to blog. We get between 1,000 to 2,000 targeted visitors a month to most of our local clients websites. We stick with very targeted content around products and services and try to break each into a page. For local it doesn’t always have to be 300 plus words. I agree that making a service page for each city is spammy, but just listing the cities served usually dilutes the list too much. What we try to do is include geo targeted case studies, photo captions, or even break location targeted pages into smaller groups of targeted city names. With typical competition levels, it seems that a list if more than 5 to 7 cities is just wasted space. Keep it focused and get creative. The content should be blog like but organized in keyword/category menu groups on pages. Galleries are great for long tail as well, use image captions, folks! That’s my two cents, great post on local blogging. Not enough love gets spread to local. Thanks Matt. I have never really done local blogging to tell you the truth. We post stuff that is industry specific and extremely niche topic oriented. Going for a localized market would significantly reduce your audience if you are trying to be a national brand. Would it not? Local business is great but if you are really that local, people can find you and read your blogs anyway. It’s a relatively new concept for us but this was a great example of how local blogging would be beneficial. Definitely sharing this. When we started blogging, we wanted to involve the community and reached out to local businesses and to chambers and asked if we can chronicle certain events. We took photos and videos of events and shared them. The people who attended loved the videos of them and shared and shared and shared. The reaction of working locally can spam nationally thru sharing business partners, family members, friends and clients. This is a terrific piece with excellent advice. I’m a ghost blogger and local blogger, so it’s really helpful to me, and will benefit my clients, too. Thanks! Oh, I used to be a real estate agent, so I can relate to those aggravating phone calls your wife received, too. This is a very timely article, we have recently been analysing the conversions vs traffic on our client local blogs. Based on the above article, we will start doing some split testing to see if we can boost the conversion rate. Thanks. That’s great advice! Sometimes from a content marketing standpoint we run out of ideas of local content to produce, but at the end of the day, we want to get our clients more business. Not including the phone number is an interesting approach. I like how the chiropractor turned his resource box into a relevant, soft-sell ad. Very good! When I’ve created local content centered around community events I’ve always tried to pick events that will appeal to that type of customer, but the advice about linking the soft sell to the event itself in the bio is pretty brilliant!